It is going to sound like a broken record from here on to the end. This series is crucial for the Bulldog’s WCHA standing. Naturally we had thought they would be jockeying for a better seed in the upper half, but right now, and likely for the rest of the season, they will be fighting for home ice. Denver is a good team, or at least they were at the beginning of the season. As UMD struggled at the start, DU soared. In their last 10 WCHA games the Bulldogs are 7-2-1 and the Pioneers are 1-5-4. Denver did have a more challenging run, but it wasn’t all top teams. One common opponent over the last 10 was Bemidji State. UMD went 1-1-0 against the Beavers and Denver went 0-1-1. The records don’t lie, but these teams need to meet head to head to determine who moves up and who stays in the bottom half. This is a series that UMD needs to win. Fans want to see UMD make it in the top six, Denver is the one team directly in their way and lead the Bulldogs by one point. StatPack. The comparison of UMD and Denver is at right. The numbers are pretty one sided for the Pioneers. UMD is still too high in penalty minutes per game. They are currently #2. The good news for this weekend is Denver is #4. Speaking of Denver taking penalties, UMD could really cash in on their power plays. It is the only stat category where UMD has a decisive advantage over Denver. Goals against are similar, it is the number of total games that differs. Home is Good. 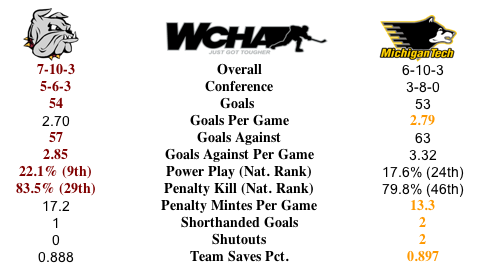 Goalie Matt McNeely has been good for his first season in college. On top of that he is really good at home in AMSOIL Arena. McNeely is a stellar 3-1-1 record with a 1.98 GAA and 0.923 save percentage. How the Bulldogs Win. Naturally a team needs to score to win. For UMD the number of goals is three. If UMD scores three or more they are 7-2-2. Now scoring three or more on the second night where UMD is 2-7-2, that would be a marked improvement. Weekend Helpers. Wisconsin plays at North Dakota and both are tied for fourth with Minnesota State Mankato, all two points ahead of UMD. The Bulldogs need to take care of their own business, but could get some help from this series. Around the WCHA and Picks by @afiskness. This weekend is an important one for UMD to stay in the hunt for home ice. The Bulldogs are taking on a Pioneer team that does take penalties, so if the Bulldog's special teams play well UMD can see positive results. In other games this weekend the whole WCHA is hoping the Beavers can find some magic against the Huskies to make this ultra tight WCHA title race tighter. The most intriguing games are the Wisconsin at North Dakota series as North Dakota seems to be playing OK but just cannot get a win and now the Badgers seem to win every week. Colorado College at Alaska - Anchorage: The Tigers had last weekend off and are looking to get closer to .500 for the season and the Seawolves continue to struggle. I think the always tough road trip will help the Seawolves and the series will be a split. Denver at Minnesota Duluth: Battle of two inconsistent teams. Both teams should be rested coming into this weekend. I think a split is in order especially since the one place UMD is consistent is the results of Saturday games. Split. Michigan Tech at Omaha: The Mavericks swept the Beavers who also happen to be the last team that the Huskies have played. The Mavericks are playing well, but I think the Huskies can find something to get a tie in one of the games and get 1 point this weekend. Omaha win and tie. Saint Cloud State at Bemidji State: The Beavers are win-less in their last eight games and the Huskies are playing great hockey; it looks like a pretty easy pick. The Beavers goal tending just has not been what they need to win recently and the Huskies are a good scoring team. Saint Cloud sweep. Wisconsin at North Dakota: This is a great match up although it sounds like injuries could be an issue for the Badgers. North Dakota has had a couple of tough weekends and have not gotten the points they had hoped to get. In they have only scored more than 2 goals one time and that game ended in a tie. The Badgers are a good defensive team and should be able to hold North Dakota down enough to get a split. The second third of the 2012-2013 UMD Bulldog’s season is in the books. In following with our past precedent, we are issuing our second period report card that takes a look at the second third of the season only. Each third of the season is 12 games this season. Offense: C. The offense is getting better and turning up the heat. But most of the time, it is just good enough. The amount of one goal wins shows a gritty team, but also is alarming that the team cannot score more to win decisively. The goal production has increased from 29 goals in the first 12 games to 35 goals. That is an average of 2.42 and 2.92 respectively. That is largely the reason the Bulldogs went 7-4-1 in their last 12 after a 3-7-2 start. As UMD pushes for home ice in the first round of the WCHA playoffs, the offense needs to keep making strides and put less pressure on the defense. Top three scorers for the Bulldogs remain the same as the last report. They are Mike Seidel (12-11-23, up 9 points), Tony Cameranesi (10-12-22, up 10 points), and Austin Farley (8-9-17, up 7 points). Pleasant surprises: Joe Basaraba and Jake Hendrickson. We singled out Basaraba as a surprise last report with three goals. He scored four more for a total of seven equaling his total from last year. Hendrickson upped his goal total from one to four during the last 12. He is an integral part of the upperclassmen and his leadership on the score sheet is great to see. Farley and Cameranesi continue to be the freshman standouts. Right now Camreanesi has the upper hand in the race for biggest impact from a freshman. Team Defense: B-. The defense has really come around and is leading the way to wins for the team. For offense it was noted the amount of one goal games. A big part of those wins is the defense holding to win the games. Over the period, UMD has allowed 31 goals, an average of 2.58 goals per game. Prior, they allowed 37 games for a 3.08 average. Just the GAA over the last 12 games is good and couple that with scoring more than allowing on average, it is a recipe to make a run. Defense will be the key to keep the team close enough to pull out wins in the home stretch. The offense has not shown they are not able at this point to score multiple goals to come from behind. Wade Bergman has stepped up to take a senior leadership role in this second period of the season. His offensive output has increased and his plus/minus rating is just a tick better going +1 in the last 12. Andy Welinski is still the freshman leader on the blueline, but he really has been the only freshman defenseman getting regular playing time. Special Teams: B. UMD is still going strong in the special teams department. The Bulldogs again have the nation’s 8th best power play just as last report, but their percentage fell from 23.7% to 22.4%. Still a great number and a good success rate. The penalty kill is getting better up from 81.4% to 83.7%, 25th in the nation. But just like last reporting period, they are on the ice too much. UMD has the second highest penalty average in the nation at 16.5 minutes per game. Seidel is tops on the team with 6 PP goals followed by Cameranesi with 5 and Caleb Herbert surging into third with 3, all in the last 12 games. Goaltending: B-. McNeely has emerged as the number one goalie especially with Aaron Crandall getting hurt at the end of 2012. Mcneely's numbers are good, but rank in the middle of the pack of the WCHA. He has a 2.60 GAA and a 0.898 saves percentage. Again, not great, but solid enough when needed to put up some one goal wins. 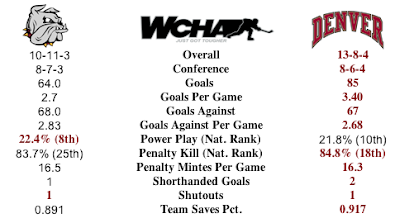 Crandall has been struggling through the season with a 3.21 GAA and 0.878 saves percentage. We look for him to get healthy and be able to be a viable alternate to McNeely when needed. McNeely posted UMDs only shutout this season, a 1-0 win over Michigan Tech. Coaching: B. Coaching is solid and reliable for the Bulldogs. The start was terrible, but the system is coming around and UMD has a chance to do something in the last third of the season. Work still needs to be done on discipline on the ice with penalties. it was good to see that discipline off the ice is happening too with a one game sit for key players when needed. The end of the season is when Sandelin seems to get the best out of his teams, so we look forward to seeing how this team ends. Overall Team: C+. Average is a very appropriate label for this Bulldog team in this second report. They moved from 11th place to 6th place before falling back to 8th this last weekend when they were idle. Home ice is the hope and most likely reachable goal for this team. If they get there, it will be an accomplishment based on how they started. Looking Ahead. The next report will be the final at the end of the regular season. During that 12 game stretch, UMD travels to only Minneapolis and Bemidji. They host Denver, Minnesota State Mankato, Alabama - Huntsville, and Omaha. It is nice to be at home most of the time, but there are plenty of challenging games in that stretch to the end of the regular season. UMD is 2-5-1 against fellow future teams of the NCHC so far this season. The Bulldogs have four more games against future NCHC teams remaining. Minnesota Duluth is making an important road trip to Colorado College this weekend. The last time the Bulldogs left Duluth they were in a similar situation being on a roll winning and looking to string some good games together. That road trip was to Florida and was a disaster. including Cameranesi and Farley pictured above. This weekend is different in that the stakes are markedly higher. The series is a conference match-up with an opponent below UMD in the standings. Additionally, CC is a team that is not living up to expectations, but certainly has the talent to make a run. The Tigers have three scorers who have more than ten goals, namely Rylan Schwartz, William Rapuzzi, and Scott Winkler. Compared to recent years, the Tigers seem to be on a down year. In reality, the Tigers are very apt at scoring. So why are they so low in the win column? It has been a let down on defense. Right or wrong, the glaring deficiency on the Tigers is their goaltending. Joe Howe was the guy during his first two years, 2009-10 and 2010-11. He was below three goals against average and above 90% save percentage both years. He was a main reason we at the College Hockey HighHorse picked CC as the preseason WCHA Champion. Man, were we wrong. Last year Howe crashed hard with a 3.48 GAA and 0.882 saves percent. This year hasn’t been real kind either with 3.46 and 0.897. So is it Howe or the defense in front of him? Which ever it is, the Tigers allow the most goals in WCHA play and the Bulldogs need to take full advantage. UMD’s Scoring. UMD does score early. But too many times they have had to hang on at the end to win. In conference play, UMD has scored the most first period goals, 21 compared to 19 for Denver who is second. The stats go from great to awful after one intermission. UMD has the third fewest goals in the second period in conference play with nine goals, just beating out Bemidji State with eight and Alaska – Anchorage with seven. The all important third period sees an uptick in UMD production with 16 goals. Add in the goals allowed and UMD has a +9 goal differential in the first period, -6 in the second, and even in the third. Don’t forget the -1 in overtime. Having a 7-6-3 conference record paired with the goals by period show that UMD is in many close games. In fact, four of UMD’s last five wins were by one goal or two goals with an empty netter at the end of the game. There is very little margin for error. As long as the Bulldogs come out on the positive side, they can keep on playing in those tight games. StatPack. The weekend will definately be about goals scored by CC and goals allowed by CC. UMD needs to take advantage of a vulnerable defense and get a lead in these road games. This is the only time this year UMD and CC are scheduled to meet. UMD's 16.5 penalty minutes per game is third in the nation for all games. in the WCHA games, the Bulldogs are second to MSUM. Short handed goals against was a problem for the Bulldogs in the Florida College Classic giving up one in each game. UMD's power play is good, but the Bulldogs have to be wary of CC's short handed counter attack. My Outlook. It is difficult to say that the Bulldogs will sweep. UMD is still a young team and road trips are trying times for inexperience. THe Bulldogs will win at least one game and two would be a definite message to the rest of the WCHA. Around the WCHA and Picks by @afiskness. It is a good slate of games headlined by the last scheduled meeting of the Gophers and North Dakota for maybe five years or more. Bemidji State at Michigan Tech: This should be a good series with the home ice the Huskies should be able to get 3 points with a win and a tie. Denver at Saint Cloud State: Home ice hasn’t been all that helpfully to the Huskies recently and the Pioneers now appear to be on track. But they might stumble this weekend, split. Minnesota Duluth at Colorado College: Fool me once…This is a favorable road match up for the Bulldogs. The Bulldogs special teams have the advantage and if they put together two good games should get a sweep. I am not ready to do that yet, so I will go with 3 points for UMD in a win and a tie. North Dakota at Minnesota Twin Cities: Series of the century. These should be two good games and may even have a fight during the game or in the handshake line if all goes bad. I will go with a split, but I think North Dakota will playing to proven something this weekend. Miami at Wisconsin: The Badgers are now surging and I don’t think it is logical to pick against them, badgers sweep. A relatively decisive weekend in the WCHA created a logjam in the top half of the conference. Five conference series took place and three were sweeps. Of the other two, one was a split and the other was a three point/one point split. Minnesota Duluth started their 2013 campaign the way they needed to advance by winning two one-goal games at home against Michigan Tech. The games were very different, but results were the same on the 1-0 and 5-4 wins. Freshman UMD goaltender Matt McNeely out dueled fellow freshman Phoenix Copley in both games to pull his record to 7-6-1. The main result of the weekend was the four points for the Bulldogs. UMD’s overall record isn’t good, but the conference record is good enough to be in the hunt for home ice in the first round of the WCHA playoffs. UMD got their wins and a team in front of them, Minnesota State Mankato, was swept putting UMD currently in the top half of the league. The unexpected part is Wisconsin is on a run and right there tied with UMD for points in the league. Coming up for UMD is a trip to Colorado College who is now in eighth place in the WCHA after a split in Grand Forks. The current places of UMD and CC were not foreseen here, but this is where we are at and UMD has to keep up their winning ways. Elsewhere in the WCHA. There was some uneasy moments Friday, but in the end, Minnesota Twin Cities pulled out a win against Alaska – Anchorage before routing the Seawolves Saturday. The Friday win was not without controversy as a borderline check from behind major was called against UAA. It was on that five minute power play that UMTC scored two goals to tie and take the lead for good in a 4-3 win. Avenging a home sweep earlier this year, Wisconsin returned the favor against host Minnesota State Mankato. Both games went deep into overtime and both game winners were scored by John Ramage at 4:28 and 4:54 respectively. Omaha took their WCHA first place team to the front range to play Denver. The Mavs lead the Pioneers by two points before the weekend. After a Denver win Friday and a tie Saturday, the two teams share the lead in the WCHA. At North Dakota, Colorado College won Friday snapping a 0-6-1 winless streak before losing Saturday. The Tigers win kept North Dakota out of first in the league and now tied for second with UMTC, their next opponent this weekend. UMTC and UND are the only two teams who have played 14 games opposed to 16 for the rest of the league. UMD and Michigan Tech have been WCHA defined rivals for years now. All that means is UMD and MTU were guaranteed to play two series against each other every year. While some look at this scheduling system in recent years as four UMD wins against a perennial cellar-dweller Huskies team, the games have been anything but easy. The teams have played many competitive and exciting games, and those that haven’t been competitive have been won by both sides. Tech has a storied hockey tradition and are on the way rebuilding their program. I for one will miss the yearly games, the possibility of UMD at Winter Carnival, and roadtrips to Houghton. Hopefully the teams can get some non-conference games with the Huskies. Looking to the Second Half. Puzzling is an understatement. UMD is a streaky team and one that will not be figured out easily if at all. The chances the team has to show fans and the WCHA that they are driven and they are not going to give up are getting short. What UMD can still do is achieve home ice for the WCHA playoffs. The Bulldogs have a disappointing 2-4-0 non-conference record is keeping the Bulldogs down. But their conference record of 5-6-3 is keeping them in the hunt, currently in a tie for 7th place. Starting the second half of the conference season, the Bulldogs have to win their games. The more difficult part to home ice is overtaking one of the top six teams as the top half are a strong bunch. Look to Denver who had a rough streak at the end of 2012 as a possible falling team or Minnesota State Mankato who may be overachieving thus far. But this is a two step process to get to home ice and UMD has to pick up there game for any chance. StatPack. These teams met on November 30 and December 1 of 2012 where UMD won Friday and tied Saturday with the Huskies. The StatPack changes from then to now were many. Record and goals for and against were in favor of MTU then but have switched to UMD’s favor now. The Bulldogs lost their goaltending advantage mainly due to the recent surge by goaltender Pheonix Copely. UMD who has been first in penalty minutes during the season, is currently third. The PP of the Bulldogs is ninth nationally and third in the WCHA. 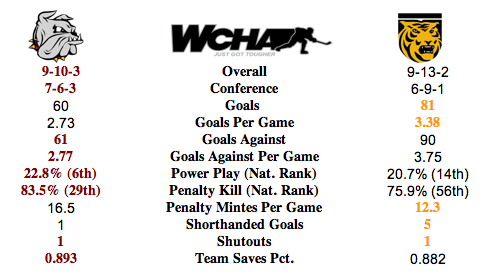 MTU's PP is tenth in WCHA play. Around the WCHA and Picks by @afiskness. Alaska - Anchorage at Minnesota Twin Cities: We all know the Seawolves always play the Gophers tough but the Gophers seem to be hitting their stride after beating the #2 Fighting Irish earlier this week. The Seawolves may be able to slow one of the games down enough to keep it interesting, but they will get swept. Colorado College at North Dakota: North Dakota is another team that appears to be hot and the Tiger do not. A trip to Grand Forks usually isn't the place a team chooses as a slump buster. I don't think the road trip will be kind to the Tigers who are swept by North Dakota. Michigan Tech at Minnesota Duluth: The last WCHA games for these two team. Tech should be feeling good about winning the GLI and the Bulldogs quite the opposite after the Florida Classic. This appears to be two even teams except the special teams. If the Bulldogs can stay out of the box, capitalize on power plays and not give up shorthanded goals they will sweep. Unfortunately this year on Saturday nights bad things happen to the Bulldogs. Split. Omaha at Denver: The Mavericks are currently on top of the WCHA standings and the Pioneers are looking to get back to the top with a couple wins. Maybe Denver figured some stuff out since the last conference games with three straight wins, but I think Omaha is too good to be swept, so I will say a split. Wisconsin at Minnesota State Mankato: The Badgers are now hot with four straight wins taking and a taking on an equally hot team in the Mavericks. It would seem with home ice that the Mavericks should sweep this series, but Wisconsin might be finding a groove, or at least enough to earn a split. Note: This article was written pre-holiday tournaments. It is dated, but sentiments remain largely the same. The real glaring update may be the Gophers commentary after they did blow Boston College out of the water. The WCHA conference schedule is on hiatus until the New Year. This is the traditional halfway point of the conference schedule. Six teams are at their halfway point in the conference and the other six are two games shy of halfway to the 28 WCHA games. The time off gives us a moment to look back at where the teams are compared to where we predicted. Below is a brief look at the teams over performing and falling short so far. Minnesota State – Mankato: The purple Mavericks have been blessed with a schedule against many teams in the lower half of the conference and MSUM has taken full advantage by beating those teams. New head coach Mike Hastings is getting the most out of a team that showed promise last season in a 12-24-2 overall record. Defense is keying the surge led by freshman goaltender Stephon Williams’ 1.95 GAA and 0.921 saves percentage for a record of 7-4-1. Wish we had that one back: A 2-2 OT tie at Alabama – Huntsville. The maybe good news out of the tie is Mankato came from behind twice in the game. Great Starts: Kudos to Saint Cloud State and Omaha for exceeding expectations thus far. Denver: A great start to the season has turned sour. Denver was an upstart surprise going 9-1-0 in their first ten games. Since then, they are 0-5-3. The story is defense. In the first ten games, DU gave up 22, 2.20 per game. In the next eight games they allowed 26 goals, 3.25 per game. Denver has used three goalies this season: senior Adam Murray (3 starts), junior Sam Brittain (8), and sophomore Juho Olkinuora (8). Olkinuora has emerged as the most reliable of the group at 4-1-3 with 1.69 GAA and 0.944 saves percentage. What the…: Fans are left wondering what happened to the expected great or decent play from Minnesota Duluth and Minnesota Twin Cities. The Gophers have not done poorly, but have not been the offensive juggernaut expected to blow all teams out of the water. The Bulldogs seem to be picking up, but are still struggling mightily for wins they were expected to get easily.